A trendy thing to do in home decorating is something called "Subway Art". Google it for examples. It's simply a canvas or framed print of words usually with a theme. It's cheap and easy artwork for your house. I decided to whip up something for Christmas. It's my first stab at it.. but I think it turned out pretty good. 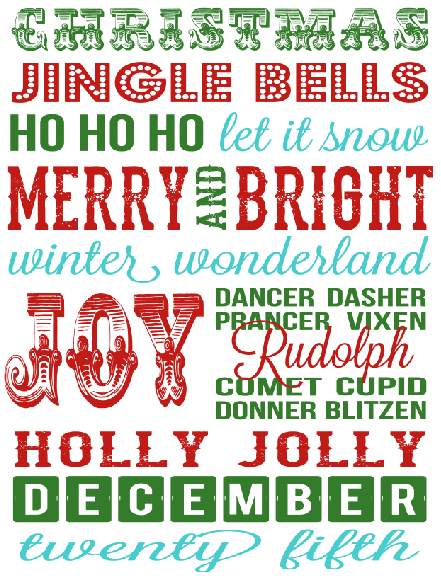 (Minus the fact that I had to go in order for the Reindeer and Rudolph's R makes the E in Comet look weird - I'm being nit-picky) I'll print it out and put it in a black frame on the entertainment center. Simple and easy!